1. 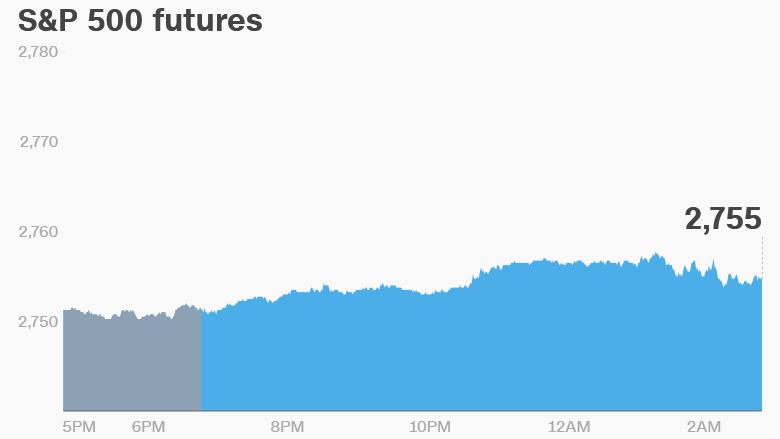 A rocky start: London's stock market opened an hour behind schedule on Thursday following a rare trading outage in one of the world's busiest financial centers. A spokesperson for the London Stock Exchange (LDNXF) confirmed that trading commenced at 4 a.m. ET after the opening auction was delayed. The spokesperson said the outage was caused by a technical issue, but did not elaborate. The benchmark FTSE 100 index, which includes global companies such as HSBC (HSBC) and Rio Tinto (RIO), gained 0.1% in early trade. Other major European markets were trading roughly 0.5% higher. 2. EU strikes back: The European Union has confirmed that its tariffs on roughly €2.8 billion ($3.3 billion) worth of American goods will go into effect in early July. The targeted items include denim, orange juice, bourbon, motorcycles, peanut butter, motor boats and cigarettes. The tariffs are a response to the Trump administration's decision to slap tariffs on steel and aluminum from some of its closest allies, including the European Union, Canada and Mexico. 3. More retail trouble: UK retailer House of Fraser is closing more than half its 59 department stores in the United Kingdom and Ireland. The company said that up to 6,000 jobs will be impacted. It's not the only UK retailer to find itself in trouble as Britain grapples with the uncertainty over the terms of its exit from the European Union. Toys 'R' Us has been wound down in the United Kingdom, costing thousands of workers their jobs. The electronics chain Maplin has gone into administration. Marks & Spencer announced last month it wants to close 100 UK locations, or about 10% of its stores. European markets opened higher, following a positive session in Asia. The Dow Jones industrial average gained 1.4% on Wednesday, while the S&P 500 added 0.9% and the Nasdaq advanced 0.7%. 5. Companies and economics: JM Smucker (SJM) plans to release earnings before the open. Shares in Alphabet (GOOGL), Google's parent company, closed slightly lower on Wednesday after the Financial Times reported that the European Union is preparing to hit the company with a huge antitrust fine. An EU competition spokesperson declined to comment on the report. The US Labor Department will publish new initial jobless claims data at 8:30 a.m. ET.